The Gadget: The Sony Ericsson Xperia X1 is the new flagship smartphone for the electronics giant. Packing the new "Panels" interface, a full QWERTY keyboard, 3G data and 800x480 touchscreen in a full metal body, is the Xperia X1 poised to challenge the top smartphones? Verdict: The Xperia X1 is kind of a mixed bag. For every good thing the phone does, there seems to be something detracting from it as well. From a hardware standpoint, this is a well built phone that feels extremely solid in the hand. But at the same time, it's not exactly the lightest or slimmest phone available (even for a slider). The 528MHz Processor and 256MB RAM also give the X1 enough horsepower to run smoothly...most of the time. The 800x400 VGA screen is beautiful, considering all that resolution is tightly packed into a 2.8-inch screen. Videos and images are bright, vibrant and sharp. The fact that it uses resistive touch techonology, however, is not so great. But my favorite hardware aspect of this phone is the keyboard. The keys are well spaced, responsive and I rarely have typos in my texts; this lets me worry about what I'm saying instead of whether or not I'm typing gibberish. The phone also has an optical sensor stuck in the middle of the four-way directional pad that lets you flick your thumb over its surface, and it will scroll up and down, side to side. It's an interesting use of tech, but feels slightly awkward, a bit gimmicky since there's already a touchscreen and a d-pad make the sensor somewhat unnecessary. On the software side, the big sell for the Xperia are its custom panel interfaces, which range from different types of homescreens, a media player interface, and even a Google-oriented screen. While selected, these panels serve as the default screen for your phone and all navigation tracks back to the panels. In theory, this is a good idea. But when you're in a panel that isn't built around a today-style screen, and you quickly want to check any missed calls or text messages you may have, this interface becomes a bit of a nuisance. But the one panel that does stand out is the Media Player. Sony Ericsson took their design cues from the PSP and PS3 and created an interface that is equally appealing as it is functional. Clean and streamlined, the media player features large icons and buttons that work well without a stylus. From the screen, you can watch movies, listen to music, view photos or even bring up your contacts list to make a quick call. Aside from the keyboard, this is probably my favorite feature of the Xperia X1. In terms of calls, signal strength and call clarity were generally good in the parts of the Bay Area I tested in, but phone screens could be better designed. When you hit the call button from your home screen, it brings up your keypad with a list of recent calls. A series of icons for call logs, favorites, and contacts sit above the keypad. In the call log subscreen, it's a bit tough to tell what are missed calls, dialed calls, and received calls at first glance. Battery life is great, as I can make calls, browse the internet, and watch videos at a moderate level for two or three days without charging it. The 3.2 MP camera has a pretty good sensor that takes crystal clear photos, and uses your touchscreen taps to autofocus on a specific object. But a slow shutter—especially in low light—detracts from the camera experience. Other than that, the software experience on the Xperia is pretty standard WinMo fare. Overall, the custom software upgrades Sony Ericsson added to WinMo 6.1 are good, but feel tacked on; ths ranges from random 6.1 elements popping up over the custom UI when you get a call or text, text messages and missed calls that go unreported or the frozen screens that occur when you try to transition to another panel/app. 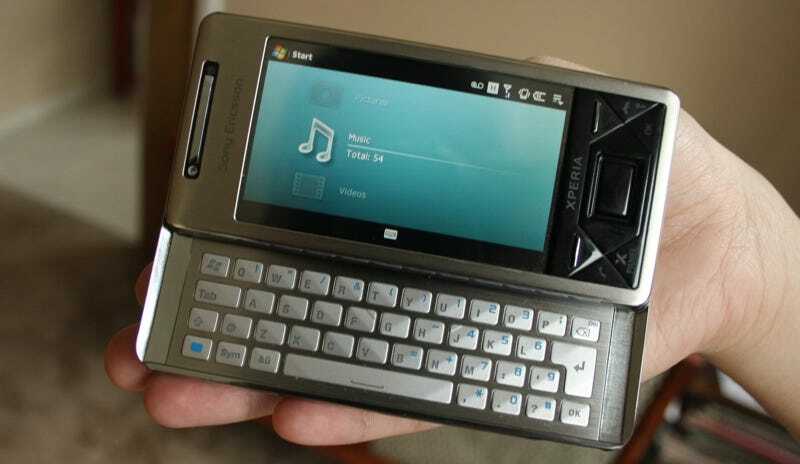 It feels like Sony Ericsson chose WinMo by default, not because it's the mobile OS they really wanted.